Location of the Fresh Kills Landfill. The Fresh Kills Landfill was a landfill located in Staten Island, New York City. It was opened in 1947 as a temporary landfill. The area used to be a swamp. It became New York City's main landfill in the second half of the 20th century. At one time, it was the largest man-made structure in the world. It was closed in 2001. At the height of its service in the 1960s, the contents of 20 barges, each having 650 tons of garbage, were added to the landfill every day. By 2001, the landfill was larger than the Statue of Liberty. After the September 11 attacks, the landfill was used to sort one third of the debris from the World Trade Center site. Around two million tons of debris from the site was taken to the landfill for sorting. The site of the landfill will become the Freshkills Park. Construction on the park began in 2008. It will be larger than Central Park. Construction on the park will last 30 years. 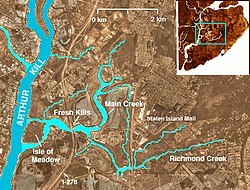 ↑ "Staten Island Landfill: Fresh Kills". Retrieved 2010-04-27. ↑ 2.0 2.1 2.2 Lloyd, John; Mitchinson, John (2006-10-05). QI: The Book of General Ignorance. Faber and Faber. ISBN 0-571-23368-6. Pages 114-115. ↑ "Items from World Trade Center Recovery Operation, Fresh Kills Landfill". Online Collections Database. Staten Island Historical Society. ↑ "Recovery: The World Trade Center Recovery Operation at Fresh Kills" (PDF). The New York State Museum. Retrieved 2010-04-27. This page was last changed on 25 March 2019, at 01:18.